It's backwards! It's inside out! It's every letter for itself! This laugh-out-loud romp is not your average alphabet book! 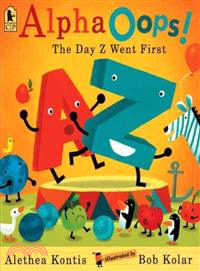 Z is tired of always having to be last when the alphabet family lines up. He is demanding fair and equal treatment! The letters (more or less) agree to go backwards, but it's not long before P has some ideas of his own. And so does H, for that matter. In fact, it seems as if almost every letter has a different opinion about how the alphabet should be arranged. It's chaos! It's pandemonium! And it's definitely not as easy as A-B-C! Filled with visually humorous details, Bob Kolar's colorful illustrations are the perfect foil for Alethea Kontis's snappy story about the comic confusion that comes when the letters of the alphabet, like a class of unruly children, step out of order and show that each one has a mind of its own. Alethea Kontis is a first-time children's book author who works for a book distributor. She lives in Murfreesboro, Tennessee. Bob Kolar is the author-illustrator of several books, including DO YOU WANT TO PLAY? and RACER DOGS. He lives in Kansas City, Missouri.